I have to preface this post by saying that this is not a typical find for me. I’ll make a few insane scores like this in a given year, but that’s not reflective of what I’m doing on a weekly basis. So even though this is my first post in our “Pick of the Week” series, this is by no means the kind of thing you’ll be seeing from me that often. I have a long history with M.A.S.K. I have video footage of myself as a five-year-old asking for M.A.S.K. toys for Christmas. I had a M.A.S.K. birthday party where my guests wore Spectrum-like party hats, and the Bullet with Ali Bombay was my cake topper that year. The toy line combined my fascination with transforming vehicles likes Transformers and Go-Bots with a manly, multicultural cast of heroes and villains like G.I. Joe. I was helpless against the awesome power of M.A.S.K. In terms of collecting M.A.S.K. as an adult, it’s been a weird experience. I’ve picked up pieces here and there if I found affordable examples. However, it’s a toy line that lasted for four years, so there are a lot of toys to collect. They broke easily and came with small pieces in many cases, so finding complete and unbroken examples is a challenge. There are a few variations, and there are several figures that were only available overseas. When you collect as much as I do, it’s difficult for you to pull the trigger one piece at a time. I had an okay collection with some of the better, harder-to-find pieces, but my collection was still woefully incomplete. In March, I found a collector online who was looking to sell his entire collection in one shot. He didn’t want to ship it, which is understandable, because it’s a lot of stuff. The toys were not necessarily perfect, with a few pieces having some condition issues like missing accessories, sticker wear, or a broken tab or piece here or there, but for the most part, it was a really nice collection of a dedicated collector, and many of the pieces did have their original boxes. There was one catch, especially for me: This collection was in Ohio. I was in New Jersey. I contacted the collector anyway seeing if we could work something out. After all, Ohio is not an insurmountable distance away. He got back to me and said I was the only person who had contacted him who was interested in purchasing the entire collection. And I get it. I mean, after all, I had more than half the collection already before contacting this particular collector, and I’m sure most collectors are like that, so we all wanted to own the really tough to find pieces. However, I have several local connections in the toy industry. I have a friend who is also trying to put together a M.A.S.K. collection who needs several of the pieces I already have, and vice versa, and if there is anything extra after we’re done sorting things out, there are a number of collectors I know locally who would be more than happy to take my duplicate or triplicate pieces off of my hands. So it’s not like I’ll be “stuck” with a bunch of extras I don’t need. I don’t want to discuss the price I paid because you also have to factor in a few tanks of gas, tolls across Pennsylvania and Ohio, an overnight hotel stay, and maybe a little bit more buying (seeing as how I hit an antique mall, four collectible toy stores, a flea market, AND a toy show on the way to and from this destination). However, the price was reasonable enough for me to say, “Yes, this is worth doing.” And yes, after having the entire collection in my possession, I can tell you with authority this was a trek worth making. Another collector friend recently remarked on how I’m willing to put in the legwork more so than a lot of local collectors. I suppose that’s true. However, as you can tell from the rest of this site, for us, a lot of the thrill is in the hunt, and so even though this was a long drive to and from Ohio for me, the thrill of picking up this collection made the time fly by. So here’s what will most likely be my second-biggest score of the year (tee-hee, what a tease! ), the entire set of domestically released M.A.S.K. toys! Well, minus Boulder Hill… but that wouldn’t fit in the picture. This entry was posted in 1980's, Action Figures, Ben, Toys, Vehicular. Bookmark the permalink. hi, what a great story! can you help me ….what is the name of the black car? i can not find it anywhere. I have a smaller mask collection that i am selling from my brother. thanks! I cleaned out my old closet at my parents and unboxed my old entire collection just last week. A few men missing but all vehicles and boulder mt intact. 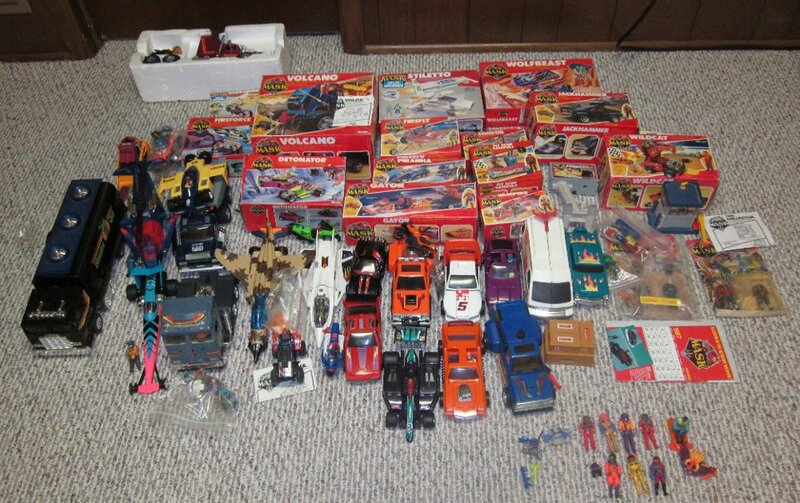 My name’s Patrick McCauley and I am trying to find a complete set of M.A.S.K. toys for my 11 year old son. I told him all of the cool toys I had when I was growing up and even showed him pictures of everything from my Transformers, Gobots, G.I. Joes and He-Man. He showed interest in the M.A.S.K. toys and I’ve been trying for about a year now. Hi.. I’m Kief from Singapore. I was born in the 80’s and M.A.S.K was my favorite cartoon. I’ve just started collecting the M.A.S.K toys a couple of months ago and almost 90% complete. Looking for Boulder hill, Outlaw,Detonator,Skybolt and a few of adventure pack. I’m finding for kind seller who can help me complete my collection.. Awesome! This is when toys were toys!